Peninsula Professional Pet Sitters was founded in 1997 and is one of the oldest pet sitting network groups in San Mateo County. All members are required to have liability insurance and bonding. A resource for clients looking for an insured, bonded, professional pet care provider. A place for pet care professionals to join together and further their education in the animal world and in the business world. 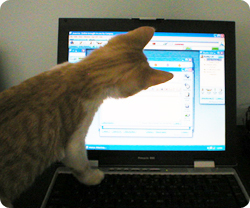 A place for pet care professionals to meet their colleagues and network with each other. Looking for a Pet Care Provider? If you are looking for a pet care provider, please choose from the drop down list at the top of this page. If you are a pet care professional interested in joining our organization please click on the link in the upper right hand corner. 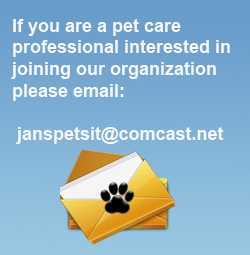 *This listing is provided as a resource to potential clients who are looking for a pet care professional. PPPS encourages all prospective clients to interview their pet care professional, ask for references and ask to see proof of liability insurance and bonding. While PPPS members are required to show proof of liability insurance and bonding each year, PPPS cannot be held responsible if any member has a lapse in their coverage. PPPS cannot be held responsible or liable for any problems a client may have with any of our member sitters.